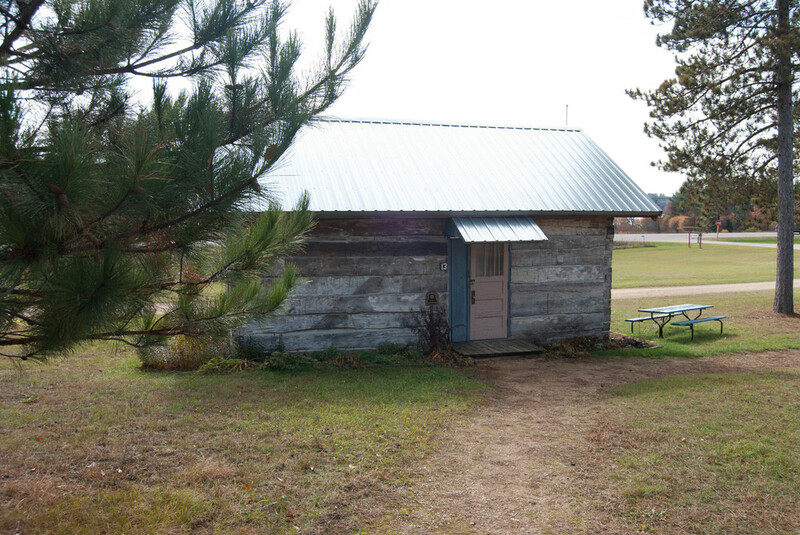 The Kruse Cabin was donated by the LaVerne Kruse family. It also was part of a farm house located south of Loganville. The ends of the logs on this cabin are square and a round wooden peg was driven in to hold the logs together. Another unique feature of this structure can be seen under your feet as you enter the cabin. This is called a puncheon floor. It is made up of round blocks of black locust about 4 ½ inches long, set on a smooth surface, and then filled with limestone siftings. You can tell much about cabins by looking at the floor. The progression of floors would be first, the dirt floor, then the puncheon, then the wide board floor, then the narrow tongue and groove floor. 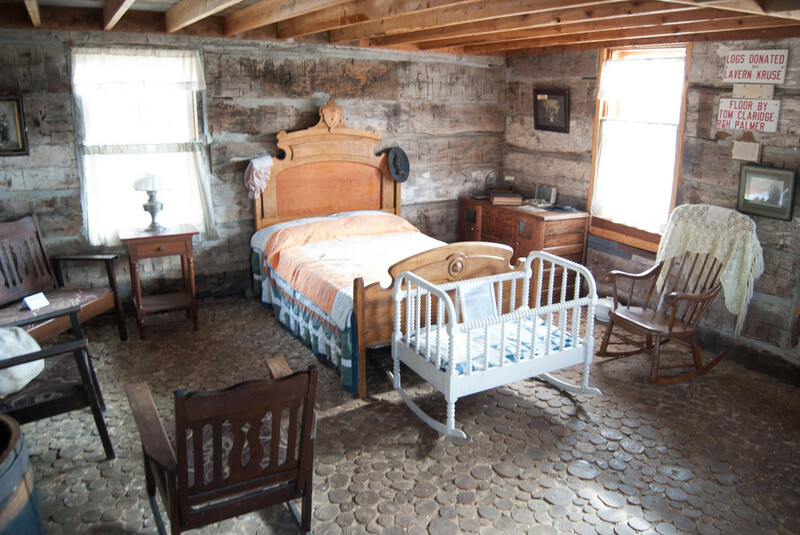 We have examples of all of these types of floors except the dirt floor. 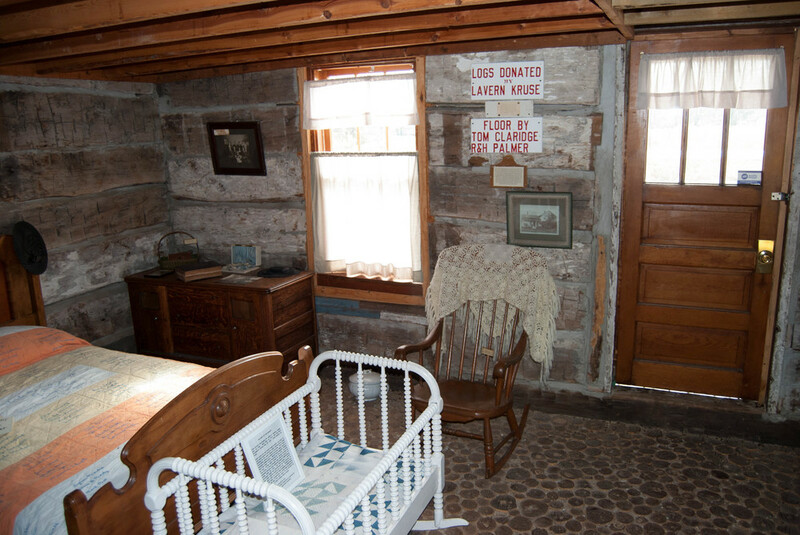 Items on display in the cabin are: A candle lantern from France, washing machine, a mountain goat coat, some pictures and a Bible belonging to the Gluth family that lived in the cabin. A spool baby crib, a bed, cow and sheep bells, a settee. The kitchen cabinet with drawers that open to the side, a stove with two doors to the oven, a copper stove pipe, a soap stone used to warm the bed, old knives, bone dishes. In the loft, please note the trunk and the Jenny-Lin bed and buggies.